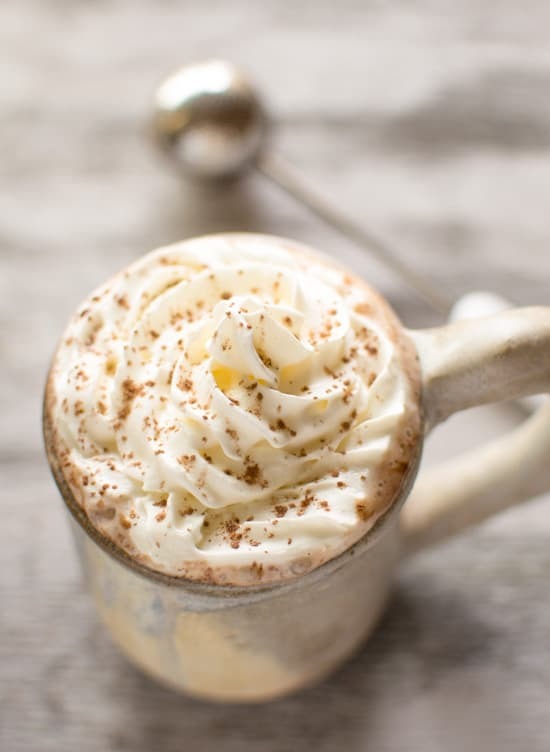 This coconut Kahlúa hot chocolate recipe is a great way to stay warm during the winter! Happy new 365 days, everyone! While many of you were busy sipping away your New Year’s Eve champagne, I was busy getting my Indian food on. And while you were getting ready to count down the last seconds of 2014, I was waking up from my curry-induced nap just in time for the countdown. Is that a sign of me getting old? Cooking with alcohol is one of those things that I don’t do enough of. Yes, I know I did just come up with some Kahlúa snack bites recently, but that’s about it! In the new year, I want to experiment with a few more mixed drinks, steep some meats in good ol’ wine, and bake some fantastic rum desserts. Where should I begin? I think the first time I feel like I “graduated” during my drinking career was when I added small amounts of liqueur to my coffee. Gone were those days of drinking Keystone Light and shots of very cheap alcohol. Drinking became a tasteful venture, and I didn’t just drink to get drunk. Admit it, we’ve all been through that phase. Adding a dash of Kahlúa to my hot chocolate not only tastes good, but it reminds me how much my taste for adult beverages have evolved. Cheers to the new year and fulfilling my food resolutions! Bring the coconut milk to boil in a small saucepan. When the milk starts bubbling, stir in the sugar and cocoa powder until the sugar is dissolved and cocoa powder is well mixed. Remove the milk from heat, and stir in the Kahlúa. Add a dash of cinnamon and stir. Serve in two cups and top it with whipped cream if you like. Feel free to use any other type of milk if you like. Make sure that you are using coconut milk that comes in a carton. The canned kind of coconut milk is a bit too rich for this. Thanks, Farrah! Let me know if you try this or if you use a different liqueur in the hot chocolate! This looks absolutely delicious. I love all the ingredients in here and well that mug is just adorable and I want it. And I am with you, I don’t use alcohol enough either in my cooking. Thanks, Michelle! I picked up the mug at my local farmers market! I’m always have my eye out for cheap props when I head over there. I didn’t even make it until midnight, so we had a mini countdown at 11:30, haha! I love that mug! Haha! Love the 11:30 countdown. I actually heard that Netflix came out with special countdown program for children so that parents could play it well before midnight! This looks incredible! I wish I had a mug right now. Is it 5pm yet? Ha! Also, a big YES to your food resolutions. I love that our food resolutions revolve around MORE food and not less. It’s good to be us sometimes! Happy New Year, Friend! Happy New Year to you too, Liz!! We’re totally birds of the same feather. This is totally going to be tried very soon! I try to consume as little lactose containing foods as I can (see: milk!) so I usually don’t drink hot chocolate, unless I want to pop some lactaid pills. LOVING that this is made with coconut milk instead of dairy milk and that it’s spiked with Kahlua, too! Perfect little drink, Lisa! Thanks, Julie!! I was actually quite shocked how well coconut milk worked in hot chocolate. This would definitely be a great dairy-free option for you. Let me know if you try it! What a gorgeous hot chocolate, Lisa – can’t wait to give this a try! Thanks, Melanie! Let me know if you do! I don’t cook much with alcohol myself. I do have some kahlua on hand though 😉 This year, I’m also going to try to actually put my cookbooks to good use more often. The hot chocolate looks amazing! Have a good weekend! YES! We are of the same mind having Kahlua on hand!! I’m thinking I need to start a cookbook club or something just so I make sure I use those books on my shelf! Love all the resolutions…I’m with you on bread baking! This looks AMAZING! Thanks, Serena! Let me know if you bake a loaf of something good! Would love to gather up more recipes and see what tasty creations you come up with! Thanks, Sonali! I was actually quite shocked how well the coconut milk worked here! I hope I can actually keep all my food resolutions this year! 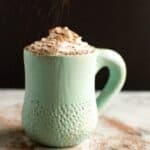 I love the idea of 5 ingredient Friday, and this hot chocolate looks amazing. Next time I’m stuck indoors on a wintery NY night, I think I could gladly curl up with a mug of this! Thanks, Natalie! Yes, this is the perfect “snuggle up” kind of drink! I need to cook from my cookbooks too! I have SOOOO many and just love collecting them, but never actually make anything :/ I always feel like I’m wasting my time by making someone else’s recipe when I can be creating my own! That’s why I usually just use them as inspiration and a springboard! I know how you feel, Rebecca! I just go a few more this Christmas, so I need to be extra diligent about cooking out of them. I generally like adapting recipes or gathering inspiration from my cookbooks, too. But if it’s something crazy that I’ve never made before, I try to cook straight from the recipe first. Yum! Love this unique take on a classic! Yum! What an absolutely fabulous drink for staying warm in the winter! Love it!!! Love all your resolutions! I just got a collection of Indian spices from my husband’s coworker and can’t wait to cook with them! I like to add bailey’s Irish cream to my coffee but Kahlua sounds equally delicious 😉 Happy New Year, Lisa! Lucky you getting all those spices!! What a coincidence too – I gave some spice blends as Christmas gifts to my family! Happy New Year to you too, Min!! P.S. Bailey’s is awesome in coffee. Ooh, this sounds so rich and decadent! Why have I never had a drink featuring hot coconut milk before? Such a good plan! The coconut milk element was something I stumbled upon by accident when I ran out of regular milk. It definitely adds nice flavor to the drink! Thanks, Genevieve! And of course, happy new year to you, too!! Hopefully we can both keep up on our resolutions this year! 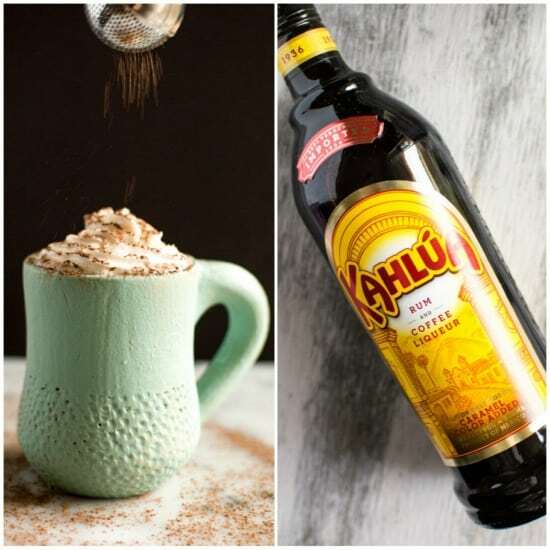 My favorite…Kahlua recipes! Beautiful pics too! This looks amazing Lisa! I love it! I can imagine having a cup right now! Urgh, guess what my colleagues at work got me for Christmas. BAILEYS. Yum…this would definitely go well with some Baileys. And definitely, over ice for you! P.S. I’ve finally figured out how to convert Fahrenheit to Celsius in my head! I think you would be proud. I love all things coconut. This looks amazing!! Thank you so much for stopping by, Vanessa! This looks so good! Also, I was in a curry induced coma on NYE as well haha thought I was the only one. Hahahah, no way! Hooray for our curry love! Thank you so much for stopping by, Leigh!! Lisa!! love this hot chocolate!!! and I love your new year’s FOOD resolutions!! I also want to cook a new recipe from a cookbook at least twice a month and love the idea of a cookbook club!!! I also want to branch out and experiment with different cuisines!!! Here’s to an adventurous 2015 for us both! Yes, Alice! Happy new year to you! Can’t wait to see your tasty food adventures this year! This looks sooooo good! I love Kahlua too! Stopped by from the Saturday Sharefest – now I’m off to see if Kahlua is gluten free. It’s cold and rainy here in Ohio and this looks perfect for cuddling tonight! Cooking with alcohol is fun! Thank you so much for stopping by, Lynne! Let me know if you find out whether Kahlua is gluten free! 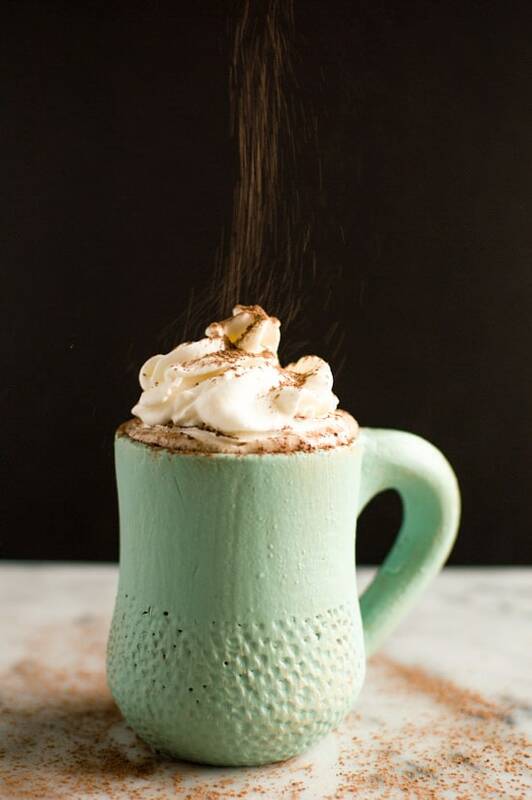 This hot cocoa looks so decadent and delicious. Good luck with your NY resolutions! Visiting from Sharefest….. Thanks for stopping by, Debra! And happy new year to you, too! Thanks, Allie! I’ll whip one up for you! Mmmm… this sounds absolutely delightful! I love chocolate, Kahlua and coconut, so I will definitely add this to my list of new things and flavor combinations to try in 2015. Happy New Year and thank you for sharing! (Stopping by from SITS Saturday sharefest). Thank you so much for stopping my, Patty! Let me know if you try this! Also … that mug! It’s so pretty. Where did you get it?? Thanks, Kristen! I got the mug at my local farmers market! This is definitely a hot chocolate recipe I will be making. LOVE my Kahlua – I have 3 bottles to choose from though, cinnamon flavoured kahlua, gingerbread flavoured kahlua and regular Kahlua.. can’t decide which to use! Oh man, I need to get myself a few bottles of that flavored Kahlua, too! 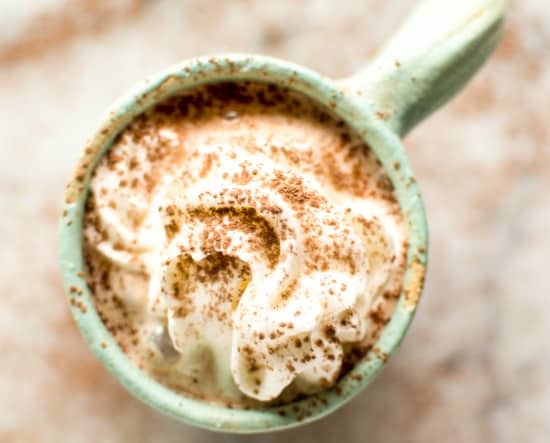 I love that you use coconut milk in this hot chocolate! I’ve used almond milk before but it makes the chocolate all grainy – coconut milk sounds like a much better idea! Oh yes! Give coconut milk a try and let me know how it works out for you! A cookbook club sounds absolutely fun! Count me in! What is Indian Chinese food? Never had that before but I’d like to try out! We reallly should do a cookbook club! I’m always curious about what cookbooks there are in China! There are some restaurants here that serve a fusion Indian-Chinese cuisine. I’ve heard that a lot of curry is involved. Of course, no surprise there. I’ll let you know when I try it! Thanks for stopping by, Patricia! Hope you enjoy it!! Lisa I just found this recipe today, the hottest day of the year so far! But guess what I don’t care I’m going out to buy a bottle of Kahlua to make this stat!! Looks heavenly!! Haha, thanks Krystal! Let me know if you try it!! Hi Sandy. The ingredient should be listed in the recipe card (just above the comments section). Are you having trouble viewing the recipe card?